While I lived in Pasadena, I hiked Arroyo Seco north of JPL many times, but never bothered with the parks, golf course, and Rose Bowl that dot the course below JPL. Enough people talk about how much they enjoy this area and I start to wonder what I have been missing. There are some main entries with parking lots and a number of smaller entries from the roads in between. I am rather indiscriminate about exactly which piece of the greenish beads of park I explore, so park in a convenient shaded street (La Loma) and wander toward east side of the creek to find one of these entries. There is one just south of the road. Wide, shallow, decaying cement steps curve their way down from the top a short way and a well used dirt path completes the journey to the bottom. 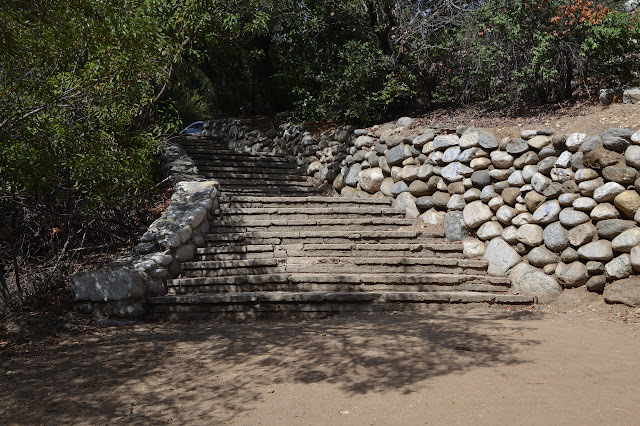 One of many old stairways that drop the first few tens of feet into the park. This one is just south of La Loma Rd. 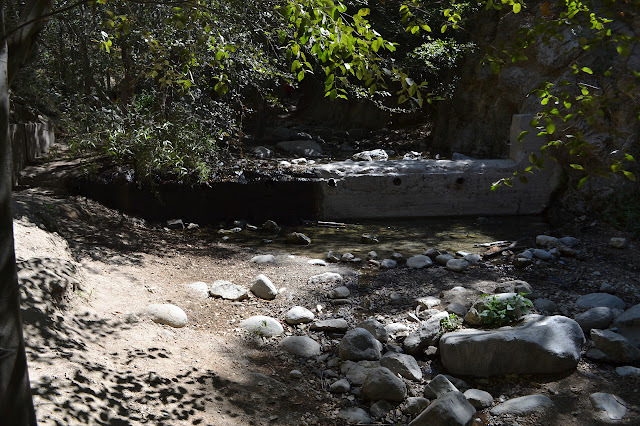 on Arroyo Blvd..
A visit to Pasadena often includes a visit to Eaton Canyon. 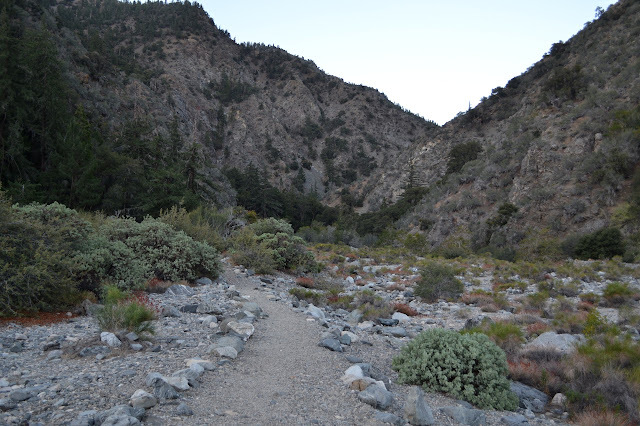 It may be dry, but this canyon is fed by a few springs up high and is reliable for water. It is hot, but we start at the Nature Center for a slightly longer walk than required. The lot is nearly full and there are people everywhere. As we stroll along the wash, there are a number of shaded spots to drop out from under the sun once in a while. People pass in large and small groups every few minutes, then suddenly everyone stops. The news down the trail is there is a snake. 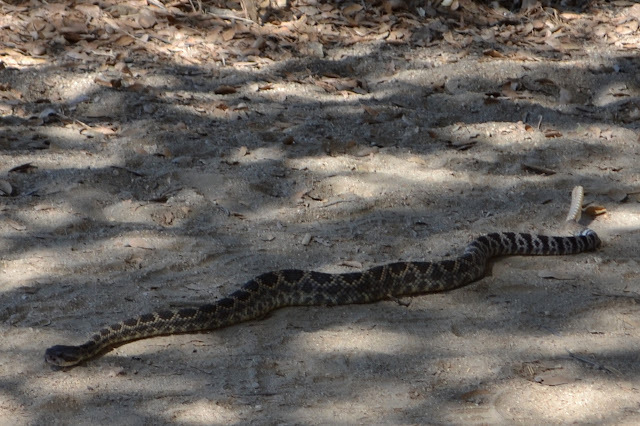 They are not lying, there definitely is a snake and it is a big one with a long rattle on the end. At the end of the wash, there is a large contingent of vehicles parked, which is not quite unusual enough. Search and Rescue gets called out enough for people falling while trying to get to the second waterfall that they have decided to close the area entirely to entry recently. Today, there is a table out and it looks like they may have another purpose in being here. As we enter the canyon, we can see and hear evidence of a little water flow as we dodge a trail runner. In winter, the water forms a curtain over this old piece of flood control cement, but now there is a trickle. I have plans for wandering up three more mountains after hitting the five while backpacking, but since I am half a day late out of that, I will just go up Winston Peak. 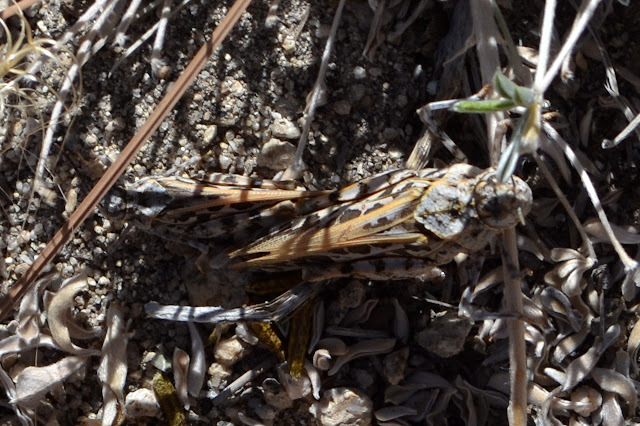 This one first came to my attention as I looped down to Cooper Canyon and then back up along the Pacific Crest Trail. 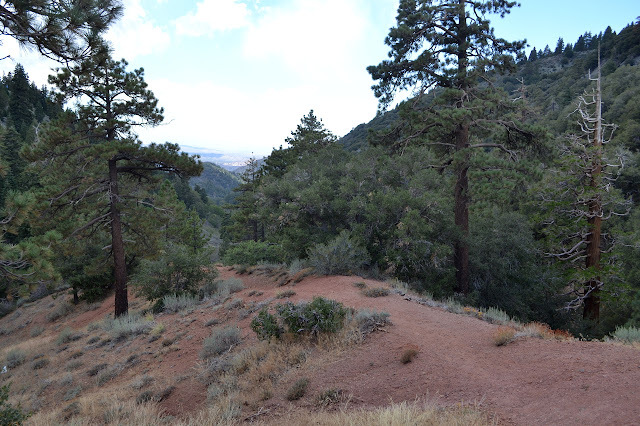 There is a very clear use trail climbing it from a saddle on the far side that the PCT also passes through. Parking at Cloudburst Summit, where the PCT crosses the road again, there is another route up following an old logging road next to the trail. There is a well used track on this side of the mountain as well. The track quickly leaves the old road, first to cut a long loop, then fully to climb the peak. Admittedly, there is no real need for a track or trail to climb this peak. The area is very open and walkable. (Day 3 of 2 3) I am up with the moon again, but this time after a wonderful night's sleep. The wind blew fiercely for a couple of hours with the sunset, but with my feet turned into it, my head was nicely sheltered. Once it stopped, it was just cool, 9000 foot air all night. The lights of the distant cities in the plains beyond the foothills are lovely. Looking over things in the morning, I find that there was a bit of moisture put down where the wind was blowing in the evening. After breakfast in the dark, there is enough time to head back to Mount Hawkins for a bit of nonsense and be there for the dawn. 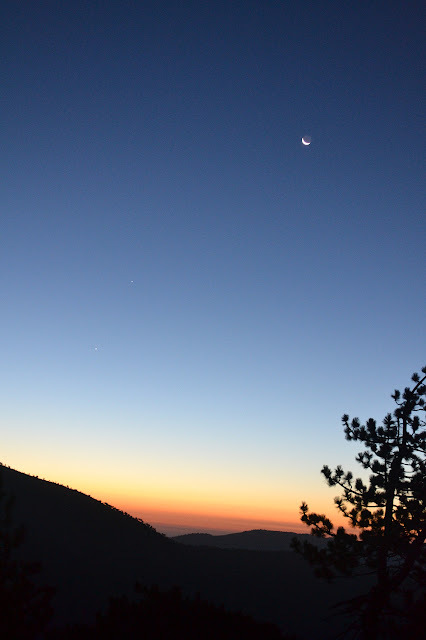 Up with the moon and a couple of planets. (Day 2 of 2 3.) It is a long night with no sleep and I am up with the moon to check out the Devil's Chair. 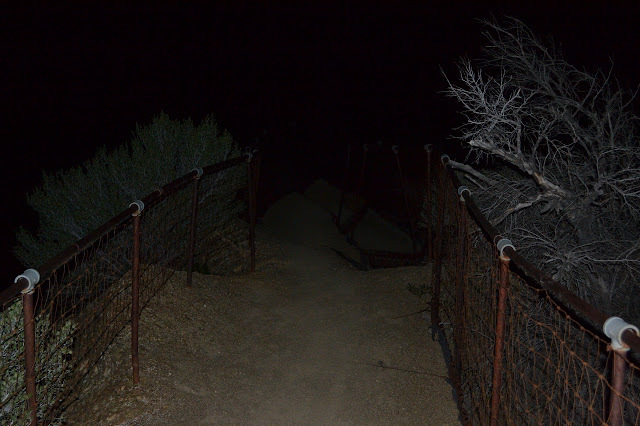 The spur trail is mostly surrounded by metal, especially at the end when it leads out onto a sandstone outcrop with cliff sides. The sliver of moon is insufficient to take in the fullness of the thing even after waiting a while for my eyes to adjust. 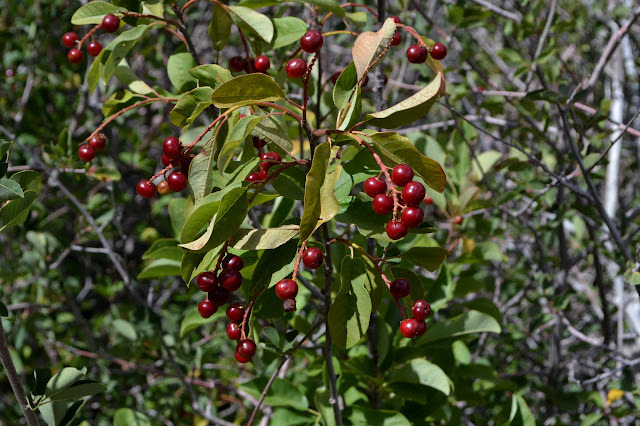 I head back, grab the pack, and finish hiking back along my egregious mistake. Dropping down along a dark trail under a sliver of a moon. I am back at South Fork Campground for the sunrise. The trail I had dismissed as coming from the campground before travels along the side of the sites, joined many times by trails from it, but keeps going. A major trail heads out from the end of the campground to join this one. It looks built, unlike the others, but is without any signs. The rock lined track continues up the creek, then seems to cross over and join another rock lined track that climbs a little on the western side of the canyon. There is purple paint on many of the rocks. 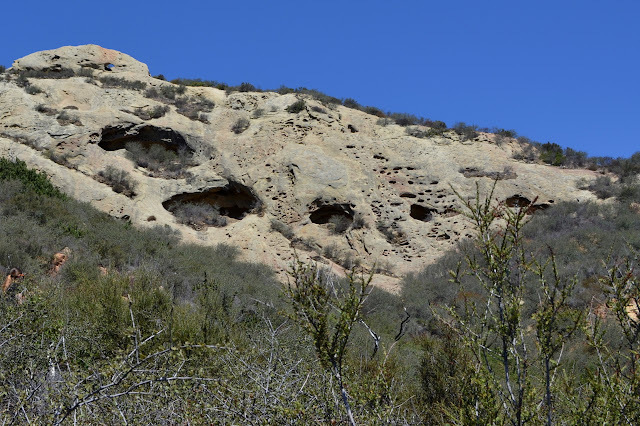 Graffiti is a problem in the Devil's Punchbowl area and it looks like it seeps out to here. The paint is quickly left behind. Starting up Rock Creek's south fork from South Fork Campground the trail is defined by rock lining. (Day 1 of 2 3) From Islip Saddle to Vincent Gap, the Pacific Crest Trail (PCT) runs along five named peaks, two of them over 9000 feet. 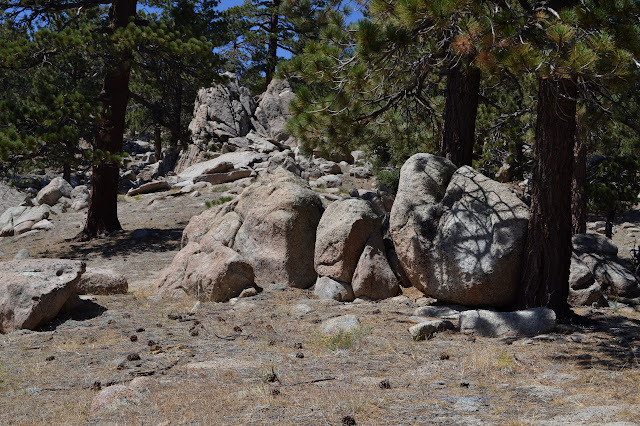 The section can be made into a loop using the Manzanita Trail, part of the High Desert National Scenic Trail, that drops from Vincent Gap down the north side of the mountains and the South Fork Trail that drops similarly from Islip Saddle to meet at South Fork Campground. This loop is around 24 miles. Water can be found reliably at Little Jimmy Spring. I want to do it as a leisurely backpacking trip with plenty of peak time, but the lack of a second reliable water source along the stretch of peaks does not seem to support that. The weather is predicted to be hotter the second day, so it seems a good idea to do the lower section first. There is also a 20% chance of thunderstorms in the area. As I arrive at Vincent Gap a little later than desired and with not quite enough light to get in the miles I want, the clouds overhead do look like 20% chance of thunderstorm clouds. A ranger doing some routine maintenance for the trailhead parking feels the need to quiz me on them as I pack up, chucking out nearly all my rain gear except a half pound waterproof jacket. There was a recent severe rain in the area, but it was an anomaly and does not look like it will be repeating in the next 48 hours. I am keeping warm with synthetics with their own water protection and are overkill for an area that will not drop below 50°F, so falling water is not my worry. Drinking water is my worry, so I grab one 2.4L bag for the hike and another for the possible camping before the spring. The trail is on the other side of the road where two roads also start. One road drops down for a similar route as mine while the other climbs. To either side of the roads, there are trails. The PCT climbs up to the east marked by a post with a crest on a post while my trail drops down to the west marked only by a break in the fence. It drops steeply initially, but is in good shape after that. There seems to be an Adopt-a-Trail program since there is a sign telling me what volunteer organization is in charge of this one right after the steep drop. Descending a well worn trail through wonderfully scented Jeffery pines. It seems like time to go after the benchmark on the top of the grassy hill on the southwest side of Gaviota. Of course, not simply by climbing the hill northward from the road as described by the reach. 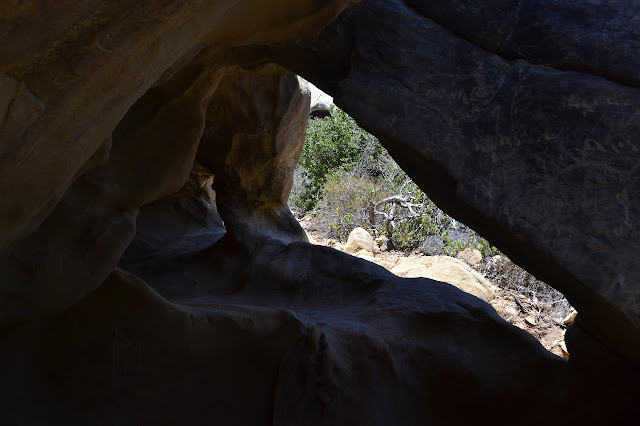 I will have another look at the wind caves, look out over the tunnel, and then push through the brush and what trail there is along the ridge to drop down onto the hill from the north. Also, bring plenty of water because it is going to be a hot one. The paved road to start is easy enough to travel, but the first, small outcrop of caves brings welcome shade after the first part of the climb. 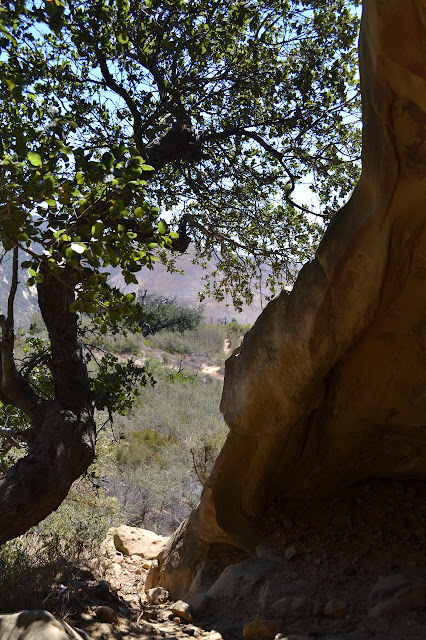 Looking past the edge of the first wind cave and its helpful oak to the trail up. This particular cave has two pillars and some nice seating, but is also heavily carved by recent visitors. The upper outcrop of caves looms above. Note the blue through the top hole.